This golden delicacy might appear to many as a frittata at first sight. If you haven't visited the coast of Tuscany or Liguria (or the Southern coast of France) you may have overlooked Cecina, or Torta di Ceci, or Farinata (or Socca in French). Though it seems simple enough to make, the ingredients being just chickpea flour, water, olive oil, salt and pepper, cecina is complicated for several reasons. First, you must prepare the batter about 3 hours before baking. You also need a cast iron skillet or pan, and the oven must reach extremely high temperatures (best obtained with a wood burning oven). Once you've made the cecina, it is best served hot and crispy with a dash of grated black pepper. Just as french fries are best served hot, so is cecina. Once it cools it looses its texture and reheating it doesn't do the trick. Another important factor is the thickness of cecina. If it is too thick (more than 1/2 a centimeter), it doesn't come out with the flaky, crispy edges it should. If you see thick cecina avoid it! The results are a pasty, soggy cecina that should be ashamed of itself! I recommend having cecina in Livorno or Pisa. In Pisa, Il Montino is the best place, hands down. Once you've tasted good cecina you will dream of it regularly. 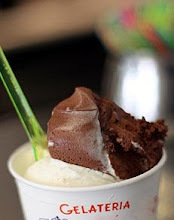 As soon as Pisa is mentioned in any conversation, I begin to dream of visits to Il Montino. I have even offered to pick up friends from the Pisa airport while selfishly thinking of the cecina that awaits as my reward. I cannot describe the heartbreak when arriving to find places closed, or that have finished their cecina just before I'd arrived... Most places prepare limited amounts (since they don't want it to sit around cold and get a bad reputation...) and if they run out after peak hours they generally don't make a new batch. Timing is everything. All the cecina gods must come together and bless you with the perfect experience: Cecina just out of the oven is the only way to go, and it is not always easy to obtain. That is why driving all the way to Pisa or Livorno in the hopes of scoring good cecina is total madness. Hence, I have been searching desperately in Florence for quite some time for good cecina. 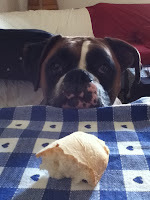 I found cecina the other day while walking Milo, the Boxer I'm currently dog-sitting. 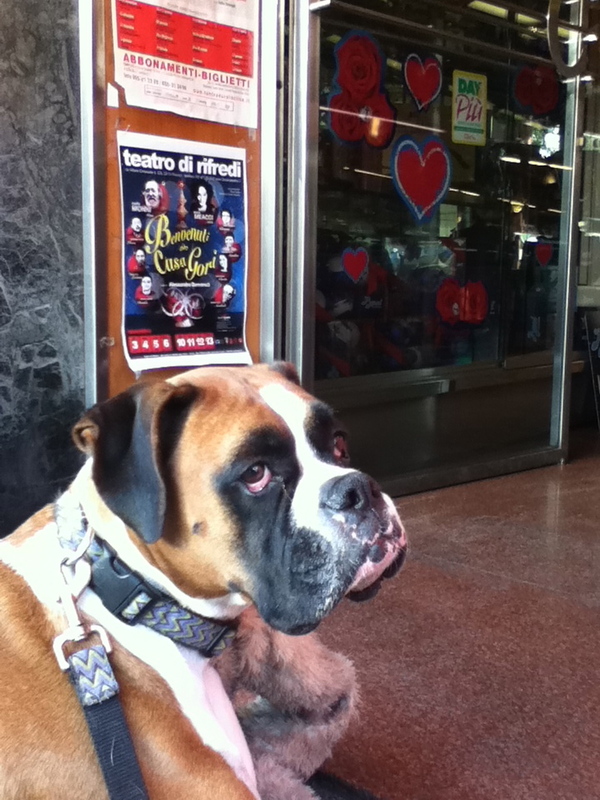 He loves to stop in front of bakeries, pizza shops, anywhere carbs and yeast permeate the air (imagine how amazing that must smell to a dog's super sensitive nose!). Milo in front of his favorite pastry shop. The result: I wait about 5-10 minutes until he finally agrees to leave. If he gets lucky, someone manages to sneak him a bite to eat when I'm distracted. I must thank my furry accomplice, since he stopped in front of a place serving pizza by the slice called Il Bocconcino. 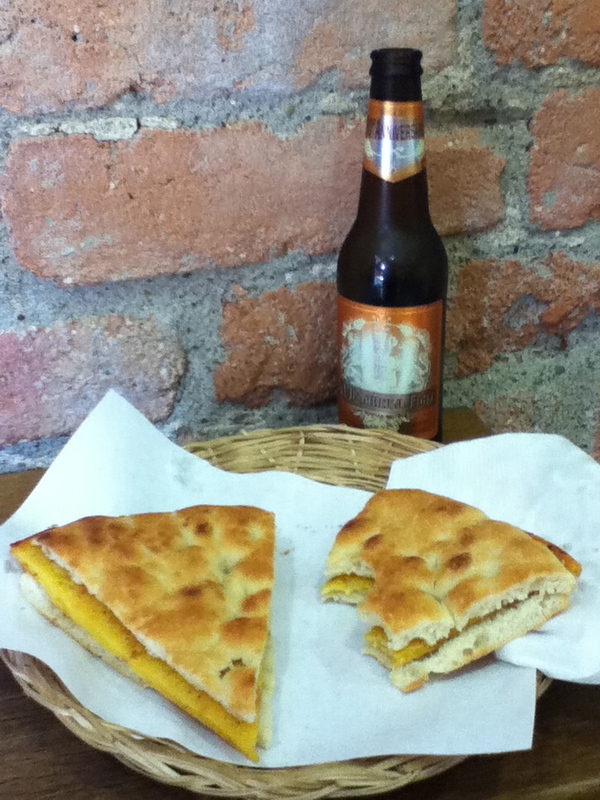 The Little Mouthful has an interesting selection of pizzas, sandwiches, and even cecina. Upon seeing cecina in the window, I mentally scanned my weekly schedule and decided I'd drop in for lunch on Wednesday. I've been anticipating this for three days! I first tried it in sandwich form, which is called Cinque e Cinque on the coast. While I chomped on my Cinque e Cinque and sipped on an Amber Menabrea (totally stoked they're making an Amber, it was perfect), I watched as sandwiches were made with care for the regulars. Since their cecina was so tasty I went back for seconds when I saw a fresh one come out of the oven. This time I ate it without bread and was able to give a full inspection. The cecina gods were in my favor today! The verdict: Probably the best cecina I've managed to find in Florence. It was only about 3.5mm high, nice and flaky and crispy on the outside and not at all soggy. I'd give it a 9 on a scale from 1 to 10. A 9 in Piazza Dalmazia (over an hour from the coast) is not bad at all. I also got a good vibe from the man who served me. His passion for what he does was evident and contagious. Most of the other clients were regulars. In fact, Il Bocconcino has named some sandwiches after their chiodi fissi, regular customers. I plan a return to try their pizza by the slice (there is one with zucchini flowers that's tempting) and their panini. And if it is fresh out of the oven, another slice of cecina without a doubt. 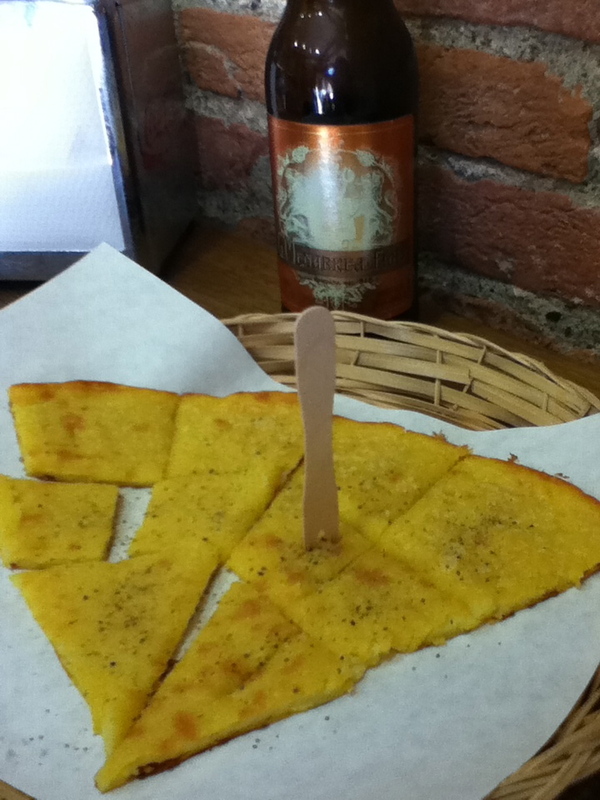 UPDATE: I returned on December 1 and the cecina at Bocconcino was a 10+!!! Il Bocconcino, already packed with locals at 12:30. A menu is seen on the left. and pizza. Italy is truly a memorable place." Here's a list that has been recommended, please send feedback if you've been to any! Please send suggestions! I can't wait to try socca there.